Option trading basics incorporates fundamental, technical and common sense decisions. One of these, as it relates to covered call writing, is selecting a strike price for the short options position. In bearish and volatile markets I tend to favor the in-the-money strike. This gives us upside potential in addition to the option return but no downside protection of the initial profit. If we buy a stock @ $28 and sell the $30 call, we have the possibility to earn an additional $2 per share if the equity appreciates from $28 to $30 or beyond. If the stock goes down in value during the 1-month contract period, the profit will be decreased or lost (unless we invoke an exit strategy). This type of strike will normally give us the highest initial option return but offers no upside potential or downside protection. If we purchase a stock @ $30 and sell the $30 call, our option return will be impressive but we will not participate in any share appreciation nor will we have any insurance if the stock declines in value. Bear in mind that when I reference downside protection I am referring to protection of the initial option profit as opposed to the breakeven which is always the entire option premium. Here we receive option profit plus downside protection but no upside potential. If we buy a stock @ $32 and sell the $30 call, we receive an option profit plus protection down to $30. In other words, if our shares depreciate in value from $32 to $30, our option profit is protected. Let’s examine this in more detail. 1- Intrinsic Value– The value of an option if it were to expire immediately with the underlying stock at its current price; the amount by which the stock is in-the-money. For these call options, it is the positive difference between the stock price and the strike price. In the above example, it would be $2 (32 – 30). Only in-the-money strikes create intrinsic value. 2- Time Value– The portion of the option premium that is attributable to the amount of time remaining until expiration Friday. Time value = Option premium – Intrinsic value. All strikes have time value (with the possible exception of deep-deep-in-the-money strikes) but at-the-money and out-of-the-money strikes have ONLY time value. What makes the I-T-M strike so special ? ROO = 150/3000 = 5% 1-month return or 60% annualized. Therefore, we are guaranteed a 5% 1-month return as long as our shares do not depreciate by more than 6.3% in that month. Successful covered call writing is not about selecting the only obvious choice using some magical formula that can be employed in every situation. There are many factors to incorporate into our investment decisions and no two scenarios are precisely the same. We can, however, use the Blue Collar mission statement of incorporating sound fundamental and technical principles along with our common sense to come to intelligent and informed conclusions. Think of yourself as the artist who incorporates his well-thought-out strokes into an eventual masterpiece. How many Picassos are created with a paint-by-the-numbers kit? 2- Technical analysis of the stock demonstrates mixed indicators. 3- An uptrending chart pattern but in a volatile manner (the Scouter Rating will eliminate many of these- see page 31 of Encyclopedia….). 4- Part of my laddering of strikes procedure: even in normal markets I will incorporate some I-T-M strikes as a way to diversify strikes. Yellow field: The $42 strike yields a 2.2%, 5-week return with a downside protection of 4.7%. Green field: The $43 strike yields a 3.0%, 5-week return with a 2.4% downside protection. Many of our readers have asked why I have been highlighting mainly I-T-M strikes of late. The reason has to do with the extreme market volatility and the fact that I am a conservative investor with low risk tolerance. More aggressive investors might opt for the O-T-M strike. There is no right or wrong as long as you are making an informed decision factoring in and understanding all available information. Remember that all these calculations are done for you automatically using the Ellman Calculator. Strike selection is based on several factors including general market assessment, chart technicals, and personal risk tolerance. The in-the-money strike should be considered in volatile and bearish market environments and when technicals are mixed. Those with lower risk tolerance will generate additional downside protection that may be more suitable to their investment needs. For the week, the S&P 500 rose by 1.1% for a year-to-date return of 13.3% including dividends. In a strong bull market would you consider using out of the money options in the example from your article? Thanks for sharing your knowledge. You make an outstanding point. Of course, the decision is based on stock technicals, market assessment and personal risk tolerance so there is no one correct answer for all investors. However, in a strong bull market when momentum is on our side I will frequently sell OTM strikes even if chart technicals are mixed. Great question! The Weekly Report for 08-10-12 has been uploaded to the Premium Member website and is available for download. You will notice a change in the “Chart” column of the Stock Screen section of the report. At the suggestion of one of our subscribers, Steve Z., we made the column more intuitive and easier to understand. On page 111 of Encyclopedia you speak of ‘laddering” the strikes. Is there a formula you use to decide on the number of itm and otm strikes? keep up your good work. There is no formula although I heavily favor ITM strikes when the market is volatile or bearish. I have been recently adding to the percentage of OTM strikes as the market reports have been favorable and earnings continue to impress. I am currently 60/40 favoring OTM strikes but this is a personal preference as more conservative or aggressive investors may have a different perspective. Alan I’m curious if you favor any particular strike choices if there is a dividend coming up. Any guidance appreciated. I would only be concerned of early exercise if there are potential tax consequences. In such situations I would favor strikes that had the greatest chance of the time value being > than the dividend to be distributed. But generally, I treat these equities as if there is no dividend and the option premium itself is enough motivation to use this security. If the dividend is captured as well, even better! As an aside, if the option is exercised early in the contract cycle, you have maximized the profit on that trade and the cash can be used to start a second income stream with the same cash in the same month. The Weekly Report for 08-10-12 has been revised and uploaded to the Premium Member website and is available for download. The stock ELLI was removed because options are not available for it. Look for the report dated -8-10-12-REVA. Is it best to sell at limit price to avoid this? As a broad generalization, it is a good idea to use limit prices. If you use market prices, the market maker can deliver a transaction such as you experienced. Over the long haul…across your investing and trading career…these pennies can add up to thousands! When I trade, the only time that I use a market order is when the market is dropping rapidly and I want to exit a position quickly. 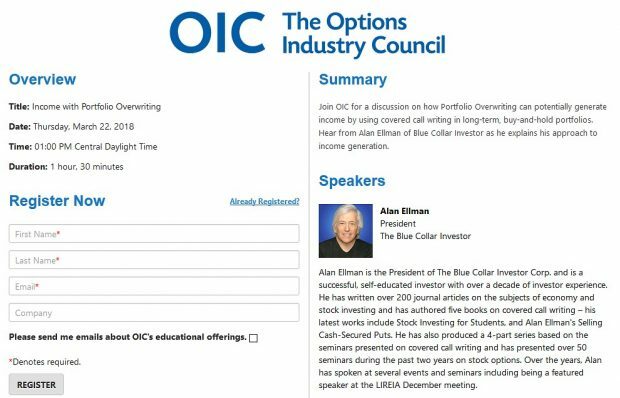 See Alan’s blog article “Playing the Bid-Ask Spread When Selling Covered Call Options” dates 5/26/12 for more information. On July 26th, Ashland (maker of Valvoline products and other chemicals) reported its 7th consecutive positive earnings surprise with revenues increasing by 23.5%. It represented a 13.3% positive earnings surprise. Projected earnings growth for 2012 has been raised to 31.9% and 15.5% for 2013. It trades at a reasonable forward PE of 11.21, inline with industry average and a stellar PEG ratio of 0.68, a 32% discount to industry average. Our premium running list shows an industry rank of “B”, a beta of 1.59 and a dividend yield of 1.20%. On August 2nd AGU (fertilizer company) reported a stellar 2nd quarter earnings report with profits up 20% year-to-year and revenues up 10%. The shares reached a new 52-week high on August 8th of $97.89. This report along with the drought in the mid-west (higher crop prices) bodes well for this company through the end of the year. AGU boasts a forward PE of 9.7 (below 15 shows value), a price-to-sales of 0.9 (below the benchmark of 1.0), and a price-to-book of 2.1 (below 3.0 shows good value). Our premium watch list has an industry rank of “A”, a beta of 1.22 and a % dividend yield of 1.00. If an option is exercised how is it determined if the premium is long or short term capital gains? Thanks for your help. If the option is exercised, the option transaction becomes part of the stock transaction. The option premium is added to the strike price received, less commissions. If the stock has been held for less than 1 year, the entire transaction is short term. If held more than 1 year it is long term as the option holding period is ignored. See Chapter 13 of “Encyclopedia….” for more details and as always contact your tax advisor before making any tax-related decisions.